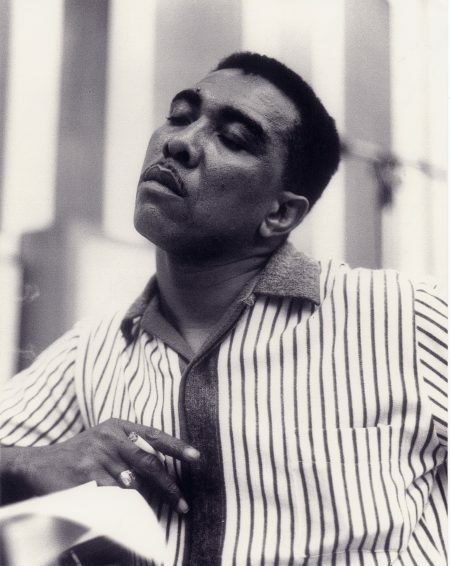 Chances are you’ve been listening to Earl Palmer (1924 – 2008) your whole life. He plays drums on “Tutti Frutti” by Little Richard, “You Send Me” by Sam Cooke, “You’ve Lost That Lovin’ Feelin'” by the Righteous Brothers, “River Deep—Mountain High ” by Ike and Tina Turner, the theme songs from “Mission Impossible” and “The Brady Bunch,” and literally countless other records—he was a first-call studio musician for decades, racking up more sessions than anyone, himself included, could keep track of. Though he always saw himself as a jazz drummer, Palmer is revered for establishing the backbeat that would define rock and roll—a strong knock on beats 2 and 4. He recalled clapping on these beats as a child following brass band drummers as they paraded through Treme, where he grew up. His home here, near the corner of North Claiborne and Dumaine, where neighborhood characters hung out by a barbershop and shoeshine stand, was surrounded by music (jazz icon Danny Barker called it a “swinging” corner). Palmer was a professional entertainer by age 5, when his mother and aunt, both dancers, brought him on stage at the Lyric Theater. (His biological father was probably the pianist Walter “Fats” Pichon.) Palmer danced with his family on the black vaudeville circuit, sleeping in the luggage rack of their tour bus. When he was home, he tap-danced for tips on Bourbon Street and beat on a drum he made out of an orange crate and a cymbal fashioned from a lard can. After serving in the army, Palmer enrolled in the Grunewald School of Music on the GI Bill. He was already one of the best drummers in New Orleans, but learning theory and how to read music would open up a world of opportunity for him. He quickly earned a seat in Dave Bartholomew’s band, the top rhythm and blues outfit in town. 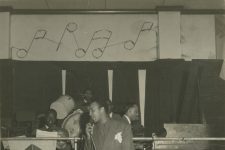 In 1949, members of Bartholomew’s band, including Palmer, became the house band at the J&M Recording Studio. Beginning with Fats Domino’s “The Fat Man” and culminating in Little Richard’s “Lucille” in 1957, Palmer “rewrote the book on rhythm in popular music” in the estimation of biographer Tony Scherman. Palmer would have rather played something more sophisticated, but these sessions paid his bills. They were a bonanza for record executives, as teenagers across the country discovered what Palmer had long known: that a big backbeat beat puts bodies in motion. The bridge Palmer built between New Orleans’ street rhythms and rock and roll is front and center in the Fats Domino song “I’m Walkin’.” The beat comes from his feet up, with a second line-style bass drum intro leading to a rap on the snare (as Palmer demonstrates in this video). Though New Orleans had shaped him, Palmer had to leave the city to live the life he wanted. Los Angeles promised higher wages, prestige, and, unlike the Jim Crow South, a chance to be with the woman he loved, who was white. Not long after cutting “Lucille,” Palmer moved to California, where his sight-reading acumen and versatility made him a studio ace. 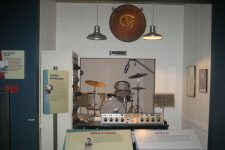 He drummed in Phil Spector’s wall of sound and Motown’s West Coast productions. After years of playing with everyone from Frank Sinatra to the Beach Boys to Dizzy Gillespie to Neil Young, he earned the unofficial title of “Most Recorded Drummer in History.” In 2000 he was in the first class of sidemen inducted into the Rock and Roll Hall of Fame. 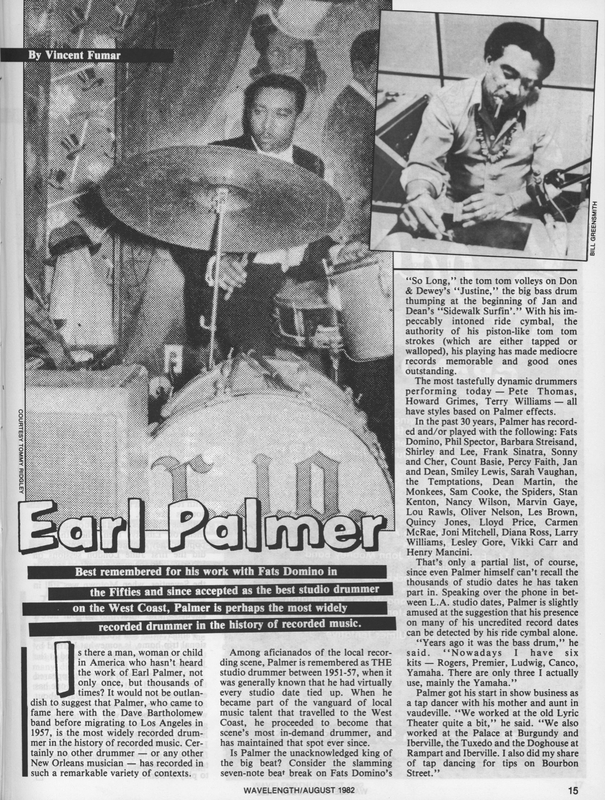 An overview of Palmer's career from vaudeville to J&M Studio to Los Angeles, where he became known as the "Most Recorded Drummer in History. 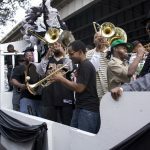 Video excerpted from "Big Easy Boogie" by Mitch Woods, posted by ertiasure2. 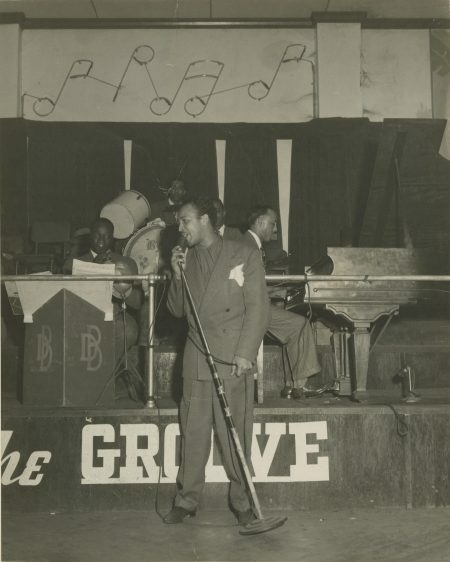 Dave Bartholomew's band, with Earl Palmer on drums, backing singer Wynonie Harris. Courtesy of Hogan Jazz Archive at Tulane University. Earl Palmer ca. 1961. 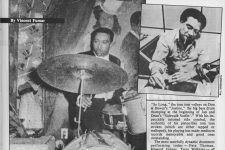 He drew on the sounds of Treme to become one of the most influential drummers in popular music. 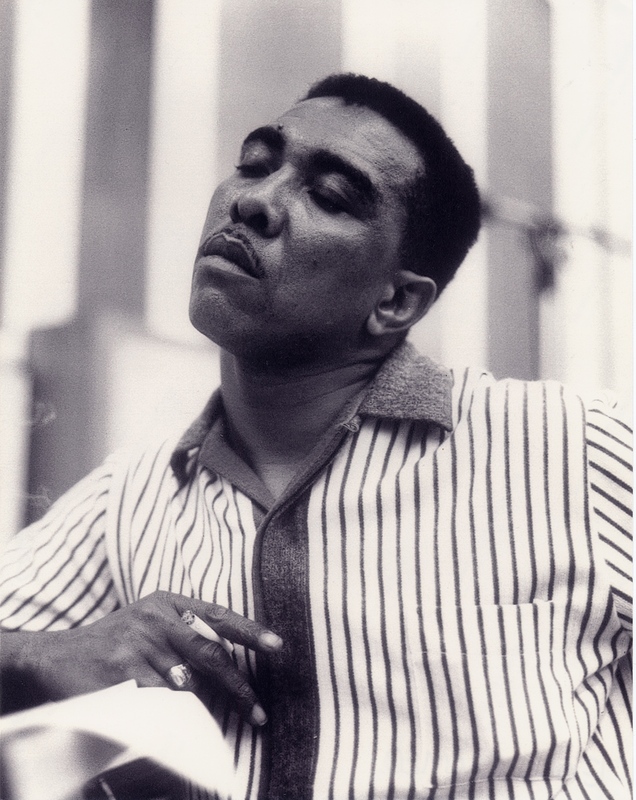 Publicity photo of Earl Palmer. 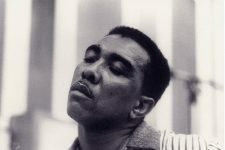 "Earl Palmer" by Vincent Fumar, Wavelength August, 1982. Full article available through ScholarWorks @ UNO. 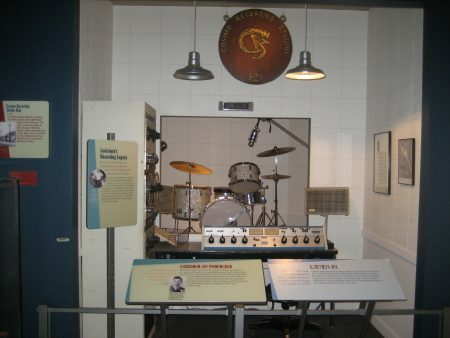 From the Louisiana State Museum in Baton Rouge, an exhibit including Earl Palmer's drum kit and the sign that hung at Cosimo Recording Studio at 521 Governor Nicholls Street.